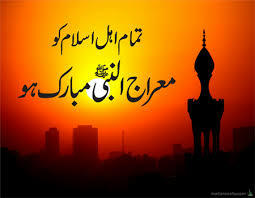 Shab-e-Meraj means the night of Ascent. It is the blessed night when the Holy Prophet of Islam was spiritually transported to heaven and he reached a high stage of nearness to God Almighty which is beyond ordinary human comprehension. The Ascent took place on 27th day or Rajab, 2 years before Hijra. The journey was not with a physical body but was a vision of the highest type. On the way the Holy Prophet, peace be upon him, met Adam, Abraham, Moses, Jesus and some other Prophets. The purpose of the Ascent was to confirm the high status of the Prophet of Islam, a position which all Muslims believe, is impossible to attain by any other human being. It is related that even Gabriel, the Angel who was accompanying the Holy Prophet remarked at one stage, 'I am forced to stop here. I cannot go any further, but you O Messenger of peace and friend of the Master of the worlds, continue your glorious ascent.It is also related that the Holy Prophet continued his journey until he reached very close to the Throne of God Almighty and attained the utmost nearness to Him. After having drunk fully at the Divine fountain of spiritual knowledge he came down to impart the knowledge to mankind.It was on this journey, that five daily prayers were made obligatory upon Muslims. Jo shaks iss Shab-e-mubaraq main ibadat-e-Ilahi main mashghool rahey ga tu Allah Tala uss shaks k dil ko murda na karey ga. Jo koi 27 Rajab ko shab bedari karey ga uss ki qabr farakh ho gi 70 darwazay jannat k iss k liyay khol diyay jaein gay.